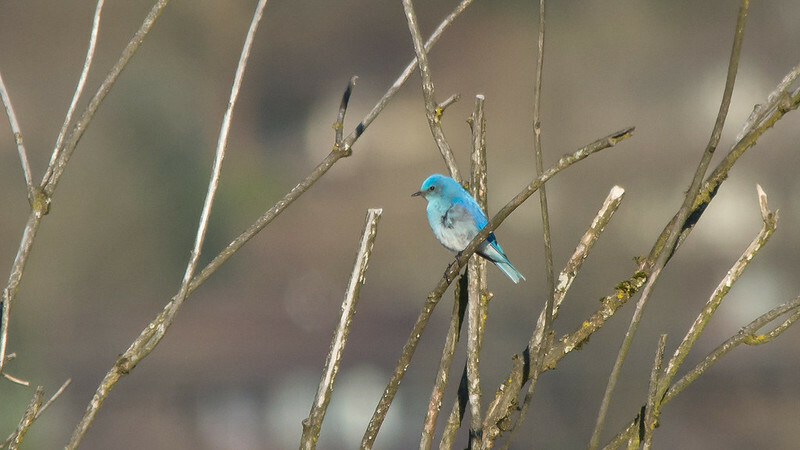 This became a bit of an obsession for me these last few weeks to get to see the Mountain Bluebirds at Colony Farm Park in Coquitlam, it took six visits. This morning around 7:30 a.m. 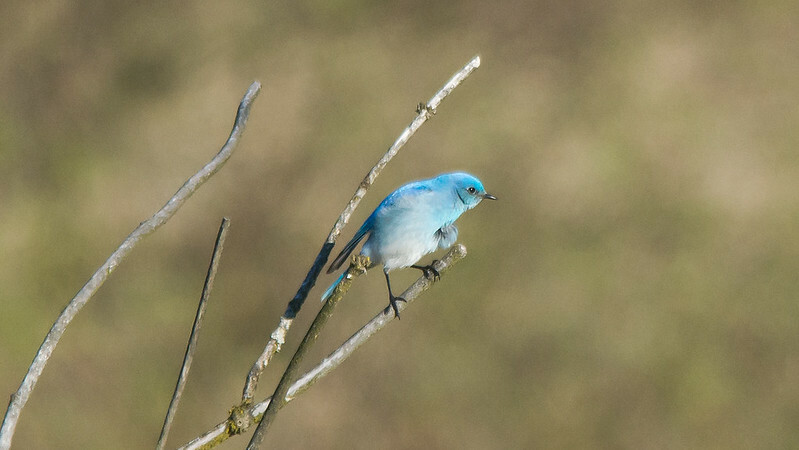 I got to see a Mountain Bluebird and get a few photos to share. I used my Sigma 150-500 hoping the extra length would help as reports were all of distant views. And that is what it was a distant view with not great detail, but I did get to see it. During the visits that I made to Colony Farm Park these last weeks I got to see the usual birds but I also got to see 3 coyote, a muskrat pulling a branch across the Coquitlam River, a pair of river otters and this morning a beaver came onto the bank of the canal not 12 feet from me. Except for the pond and the area near the Lougheed Highway, I find Colony Farm is not particularly suitable for photography. I wouldn't bother looking for Mountain Bluebirds there. A couple of years ago an Eastern Kingbird had a nest right by the path near the pond, but most interesting birds are too far away for photos. Fine for those who are making Yearly/Monthly lists, though. I think the Lazuli Buntings nest in the tall trees by the main parking area and can often be seen near the parking lot. Someone told me a story of one male vigourously attacking its own image in a parked car's side mirror. If I were looking for MBs now I would try Grant Narrows (where you can get closer) or some areas along the Fraser in Burnaby. I think I'll drive down to Arizona instead. Fantastic Nick! I am so happy for you and these are beautiful shots of a beautiful bird! Your first MOBL, after great effort, with all kinds of side benefits. I'd say you've had a great time and the results are warmly appreciated by those of us who sometimes have to make do with less than professional shooting circumstances. I don't think you'll find many on this forum who don't think you've done a splendid job. I know I do! Your persistence, I hope, will encourage others to keep pursuing their birding goals, too. And this will not be the last MOBL you show us; of that I'm certain. I just want to make it clear that I wasn't criticizing Nick's photos, but the location which has, IMO, an over-rated reputation WRT photographic opportunities. I recall Nick mentioning in other threads about going to Colony Farm seeking such subjects. Many nice birds appear there, but unless you have a mist net, you aren't going to get close enough to them. Mountain Bluebirds are just passing through. I suspect that they follow waterways on their migration route to higher elevations. A couple of years ago I came across a dozen or so foraging along the shore of Pitt Lake, paralleling the dyke around the marsh. Last year one was hanging around the Indian Reservation at the Tsawwassen Ferry Jetty for a few weeks. Someone reported seeing one in Burnaby near the Fraser River. They also may appear at the Hope Airport which has a grass landing strip, ideal for these birds. I hope Nick didn't think I was being critical of him. I have complimented him in PMs in the past. No problem Mike! Colony Farm is far from the perfect bird photography site. I have spent a lot of time there this last year and I have had some good success and also visits which were a bust. Bird photography is as much about shooting birds for me as getting out for a good long walk away from the stress of the world. Your suggests of alternative Bluebird sites are welcome. I heard originally someone saw over a dozen at Colony Farm but I only saw the one. Its all good, the more information out there the better time we all have. I agree Colony Farm can be a very hard place to photograph other then a few spots, but its the closest place to where I live, so its become good place for me. I think best spots to photograph in lower mainland would be reifel, boundrary bay, piper spit, Richmond nature park so sometimes that's life, and reality is that majority of the pro photographers who take amazing photos, have food, in there to attract and get the best photos with not too much challenge. Guys like Alan Murphy put food in perch settings to attract woodpeckers, etc. We as amateurs, just take pride in taking good photos in there natural environment. Every spot has something different too offer! Some places attract a lot of geese, while others attract surf scoters, bufflehead, mergansers, ring necked duck, so it really depends on your photographic goal! and unless your at reifel the birds are going too be 50metres away or more, unless you stay very low, relaxed will they come within the closer limits. -171 birds lifelist in B.C. and Pt. Roberts. Way to go! 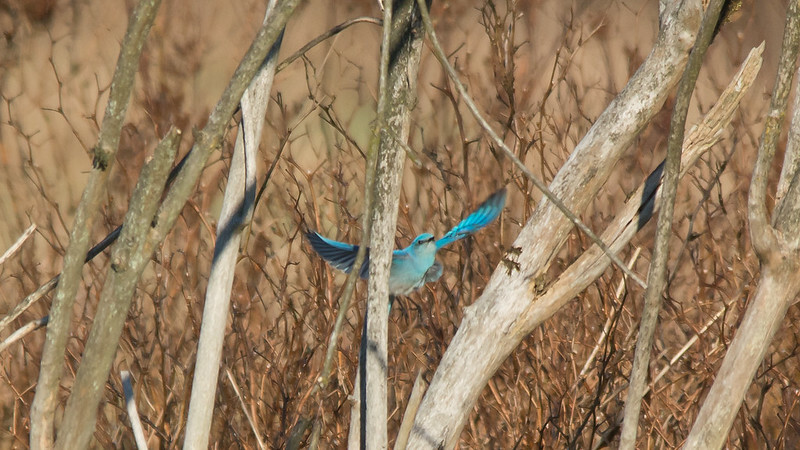 I have yet to get a decent shot of a Mountain Bluebird. Lovely colours. "Look and You Will See"
Great shots Nick, i've never had any luck with bluebirds at Colony Farm, seems the best locations are near the bird-banding stations (photogs not welcome there). Grant Narrows in Pitt Meadows usually gets a few and i've seen but not photographed them there. For me, the interior is a sure bet, nice that you were able to nail a few locally though. Absolutely beautiful pictures. 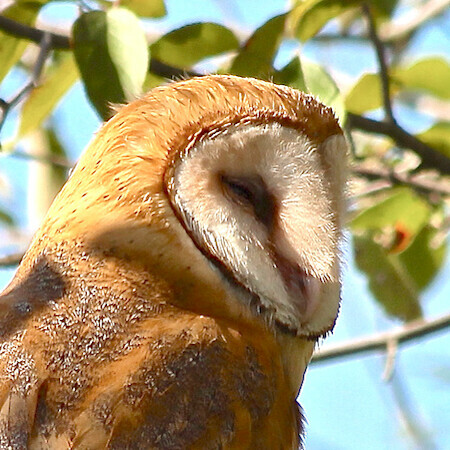 I'm planning on going there tomorrow morning to see this elusive bird. Can you give me a hint as to where you saw it? I could be wrong, but I think his thread is many years old, and for some bizarre reason this forum does not show the year as part of the date. Ha! Thanks for the heads up. Still going though, wish me luck! Good luck! A bunch were seen at Spanish Banks the other day!